Although uncommon in Guinea pigs, Cushing's disease occurs when adrenal glands produce too much of the hormones that control stress, blood pressure and heart rate. Fluctuations in hormone levels may lead to many problems, such as hair loss, high blood pressure and increased urination, increasing the the risk of diabetes. 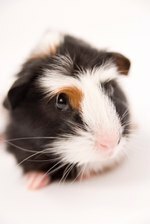 Managing the disease is the only solution to date, and treatments are available to help reduce the symptoms and allow your guinea pig to live a happy and comfortable life. Cushing's disease often develops in response to benign tumors located at the pituitary or adrenal glands located near the kidneys. While the tumors are not often removed due to the high risk of the surgery, drugs are available to stabilize hormone production and alleviate symptoms. Symptoms of Cushing's disease varies between guinea pigs. Pigs may experience the mild discomfort of hair loss, or increased thirst or appetite, to more serious symptoms such as rapid breathing or skin lumps. Cushing's disease may be diagnosed through an ultrasound. An ultrasound shows the size of the adrenal gland. Adrenal glands in a healthy guinea pig measure 3mm to 4mm in size; an enlargement of these may indicate disease or detect a tumor of one or both glands. Vets suggest that a healthy guinea pig receive an ultrasound alongside the one that is experiencing problems for comparison; this is the easiest to recognize differences and problems. Cushing's disease is not contagious to other guinea pigs nor to pet owners; the disease is the result of a hormonal imbalance, not caused by an infectious disease. Daily treatments of L-deprenyl helps reduce the size of the adrenal glands, while other drug therapy may be used to destroy part of the glands to decrease the overproduction of hormones. These treatments are dangerous and need to be monitored carefully by a vet to prevent damage to the glands. Herbal remedies, such as Cushex drops help relax the adrenal glands to decrease the overproduction of hormones. Partnering with your vet to decide which treatment option is best for your guinea pig is vital to treatment.